Oh my oh my, have you guys tried Hershey’s cinnamon baking chips? They are so, so good! I found this recipe for cinnamon churro Chex mix on Pinterest and thought it was intriguing enough to try. 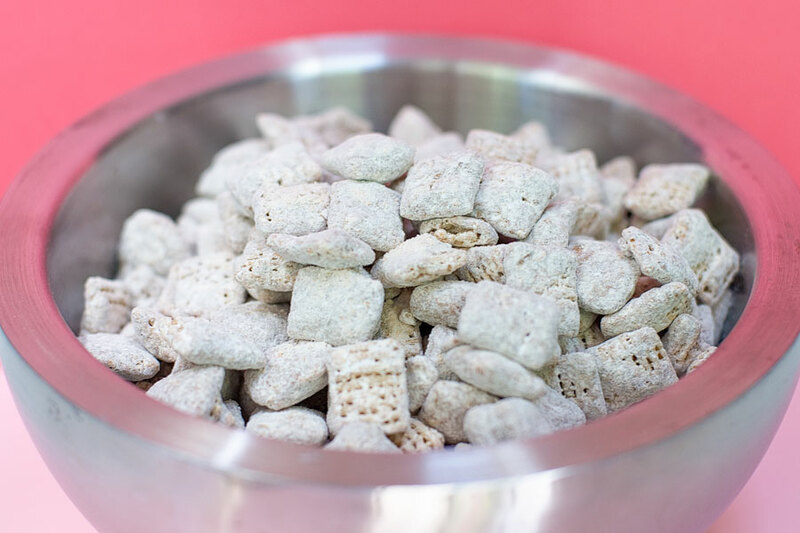 As I have mentioned before on this blog, puppy chow is one of my all-time favorite treats, so I knew this recipe would be a hit for me. It’s just as easy to make as regular puppy chow — maybe even easier because you don’t have to blend and melt any peanut butter or chocolate. 1. Pour Chex cereal into a bowl. Set aside. Combine sugars and cinnamon in another small bowl. Set aside. 2. In a microwavable bowl, melt the cinnamon chips. Heat for 1 minute then stir. Heat for an additional 30 seconds. Stir. Continue with additional 30 seconds until completely melted. Pour melted cinnamon chips over the cereal. Stir until cereal is well coated. 3. Transfer the coated cereal to a Ziploc bag. Pour in the sugar + cinnamon mixture and toss to coat. If you find that you want more powdered sugar, just add more to your liking.